Sunye, main vocalist in the famous girl group "Wonder Girls," serves as PR ambassador for "Wicked Snow." One of South Korea’s traditional summer confectionaries called “patbingsu,” a snow-like ice dessert with red bean paste or a sherbet with red bean paste, is hitting hard the streets of Seoul scorched by the burning sun. Developed by a local marketer “BARS International,” the “Wicked Snow,” a red bean paste sherbet with red bean pastes or also with fruit cocktails, is gaining a huge popularity in the South Korea’s summer confectionary market. 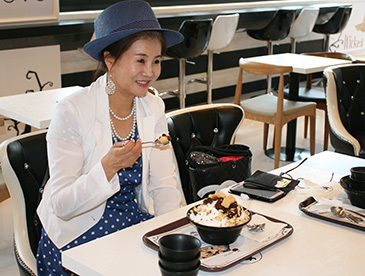 “With the addition of milk and coffee the “Wicked Snow” patbingsu has a special flavor,” said President Min Byung-Don of “BARS International,” a manufacturer of “Wicked Snow” as well as an importer of food materials. Recently opened near the main gate of Hongik University in Seoul “Wicked Snow” café is spacious enough to attract young men and women particularly from nearby universities including Hongik and Yonsei. The interior walls are painted white with large transparent windows and its Nordic-style furniture add foreign flavor to the “Wicked Snow” desert café. Among the scores of menu are “Wicked Milk,” “Wicked Mango,” “Wicked Burry,” and “Wicked Choco,” all made of snow-like milk ice. 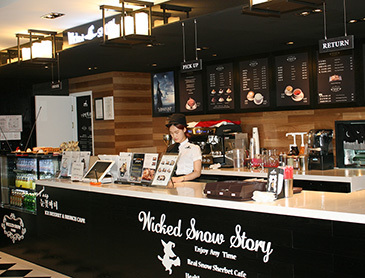 In particular, the “Wicked Snow” café offers various tasty coffees including Americano, Cafe Latte, Cafe Mocha, and Caramel Macchiato, all produced from coffee beans directly imported from Colombia. For the hungry guests in wait are a variety of sandwiches and toasts. A crowd of young folks are seen quenching their thirst or cooling their heated body inside the neatly designed café. President Min operates “Wicked Snow” café also near Sungkyunkwan University and one in Seolleung Subway Station in Gangnam area of Seoul. He has opened three in Busan, the second largest city in the nation. President Min plans to open soon more in nation’s major cities including Daejeon, Daegu, Gwangju, and Yeosu. Franchise business opportunities will soon be available for “Wicked Snow,” according to President Min. President Min’s business knows no national boundary. He signed an exclusive business deals with Thailand for their equipment and ice products in April 2009. Two years later he began exporting his pulverized ice makers to Malaysia. “Wicked Snow” Rounge – quite different from others “Wicked Snow” interior design is simple and neat with the combination of black and while color. Also luxury furniture makes the café stand out among others. In year 2013 he started exporting his equipment and ice dessert products to as many as 20 countries around the world including the US, Malaysia, Australia, and Thailand. For maintaining his already successful business President Min spares no efforts in developing new ice dessert products and its related equipment. He holds a number of patent rights for developing the related pulverized ice makers. 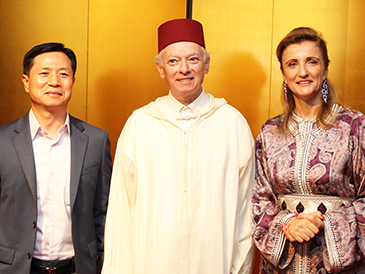 President Min Byung-Don (left) of "Wicked Snow" poses with Moroccan Ambassador to S. Korea Mohammed Chraibi (center) and his wife, Madam Amal Lahlou, poses with at 2014 "Throne Day" reception held at Lotte Hotel in Seoul on July 30, 2014.